Black Clover has become the shonen that could under Studio Pierrot. After a rough start, the series has gained a loyal following, but that group will be tested soon. It appears the anime is ready to host a big crossover event, but it will not be with any series you are expecting. Recently, reports surfaced about Black Clover's big collaboration plans. 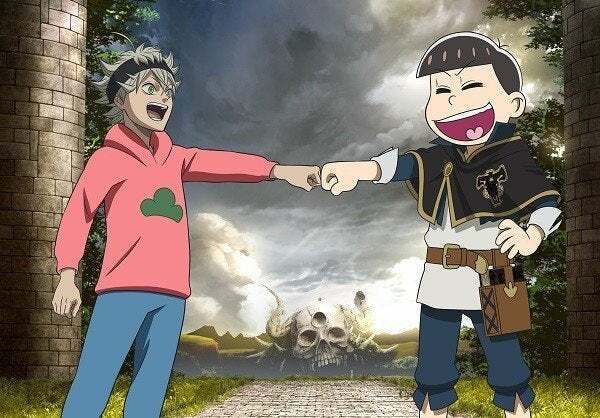 The anime will teaming up with the film Eiga no Osomatsu-san for a special crossover, and it will expand Black Clover a surprising bit. As the announcements break down, Black Clover will put out a new episode on March 26. The piece, which is titled “Magic Knight X”, will feature a special appearance by the Matsuno sextuplets of Osomatsu-san (via ANN). The crossover will be a one-time deal, and it is being done in an effort to to hype Osomatsu-san’s new film. The feature debuted in Japan last week, and it features the Matsuno sextuplets at their high school reunion. The group laments who their peers have become full-on adults with jobs, but the sextuplets wake up the next morning to something that will change their lives. A key visual for the anime collaboration was released, and fans admit it caught them off guard; In fact, a good many questioned if it was fan-art at first. The poster sees Asta, the lead of Black Clover, dressed up like Osomatsu Matsuno while the oldest sextuplet is seen wearing Asta’s Black Bull robes. So, do you think this crossover has potential? Let me know in the comments or hit me up on Twitter @MeganPetersCB to talk all things comics and anime!